Vice President Mike Pence, behind right, talks with Homeland Security Secretary Kirstjen Nielsen before taking a boat tour of the Rio Grande with the U.S. Border Patrol Friday, February 16, 2018, in Hidalgo. HIDALGO — With a border fence symbolically at their backs, more than 20 members of the Rio Grande Valley Equal Voice Network on Friday held a news conference here just hours before Vice President Mike Pence landed in McAllen. The gathering of immigration advocates was in protest of the lack of community representation during the vice president’s visit to the Valley. Standing only feet from the U.S.-Mexico border and next to the Hidalgo Port of Entry, a facility Pence was scheduled to tour, members of the advocacy network held protest signs and chanted anti-wall and pro-immigrant slogans. 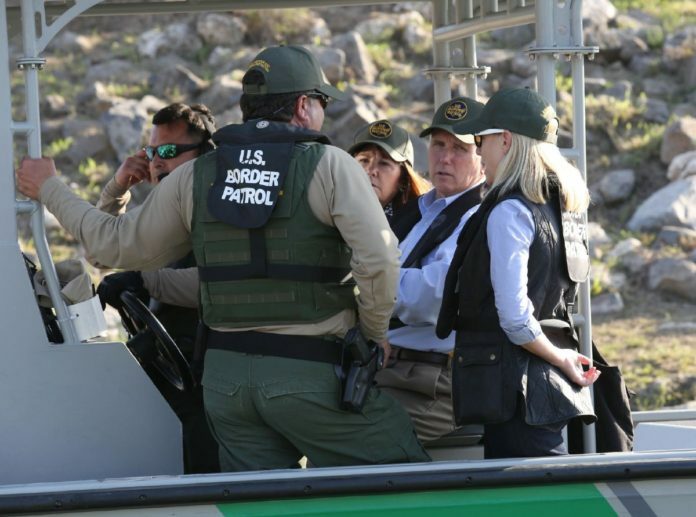 Pence, who was also going to be on a boat tour on the Rio Grande, was scheduled to meet with law enforcement and U.S. Customs and Border Protection officials as well. RGVEVN members, including the ARISE, Proyecto Azteca and La Union del Pueblo Entero organizations, conveyed their displeasure with the VP after learning that he would be meeting with law enforcement and CBP officials, but not with community members directly impacted by his administration’s immigration policies. Patiño Houle said Pence’s decision to meet with U.S. Customs and Border Protection officials during his visit and not with members of the community impacted by border wall construction leaves the vice president with an unclear picture of the impact the aforementioned construction could have on the region. In addition, Patiño Houle invoked “mixed-status families” living near the border, further stressing that Pence can only receive “one side of the story” by meeting with law enforcement. “That’s a completely ungrounded way to start constructing policy,” she said. It’s not the first time opponents of border wall construction have derided government officials for the lack of a seat at the table. In a closed-door meeting last July, U.S. Border Patrol Sector Chief Agent Manuel Padilla spoke to mayors and city managers from Brownsville, McAllen, Rio Grande City, Edinburg and other cities to discuss the border-wall-related construction in the region, and to go over proposals for budgeted and non-budgeted fencing along the border. Absent from the meeting were community stakeholders, those who would be impacted by construction in the region. When U.S. Department of Homeland Security undersecretary William Bryan toured the Santa Ana National Wildlife refuge last November, Scott Nicol, an executive member of the Lower Rio Grande Valley Sierra Club, underscored that despite multiple invitation-only and closed-door meetings between CBP officials, local mayors and other “stakeholders,” CBP has yet to hear from the general public and those who would be most affected by border wall construction. The Sierra Club is a local environmental group and vocal opponent of border wall construction in the region. Pence’s visit comes a week after a pre-solicitation notice was published by a government website advertising a levee wall system project worth between $25 million and $100 million for about 3 miles of construction in Alamo, where the more than 2,000-acre Santa Ana National Wildlife Refuge stands. Vendors would be able to submit bids beginning Feb. 25, with the contract expected to be awarded by early May, according to a government website that publishes federal contracts. The vice president’s visit also comes a day after bipartisan negotiations between lawmakers in Washington went nowhere after four separate immigration proposals were rejected. On Thursday, lawmakers hoping to come to an agreement on a bill to replace DACA — or Deferred Action for Childhood Arrivals program, the Obama-era executive action that shields from deportation more than 700,000 undocumented youth brought to the country illegally — left the negotiation table empty-handed. This left hundreds of thousands of Dreamers’ lives in limbo with a March 5 deadline looming. The deadline was created by the Trump administration when they announced the end of DACA in early September 2017, saying it would be left up to Congress to hash out a deal to replace the program. Immediately following the announcement signaling the end of the program, several states filed lawsuits against the Trump administration arguing federal authorities have gone back on their promise to protect young immigrants who came forward and registered with the government. As a result of the litigation, courts in California and New York have issued temporary injunctions requiring the administration to extend DACA. Those rulings could render Trump’s deadline moot. Trump had proposed a path to citizenship for 1.8 million young immigrants, meeting a top Democratic demand. But that plan also included $25 billion to build a wall along the U.S.-Mexico border and enact other border security measures, tighter restrictions of family-reunification, and an end to a visa lottery that encourages immigration from diverse nations. That proposal offered the citizenship pathway for Dreamers and $25 billion for border security but doled it out over 10 years. Trump’s bill would have prevented legal immigrants from sponsoring parents and siblings for citizenship and would have ended a visa lottery aimed at allowing more diverse immigrants into the U.S. The compromise bill would have left the lottery system intact but barred Dreamers who obtain citizenship from sponsoring their parents. In a tweet early Friday morning, President Trump blamed Democrats for Thursday’s events. Abraham Diaz, a Dreamer and education specialist for the local immigrant advocacy group LUPE, said despite the lack of progress on deals for DACA, he was happy that none of the proposals were agreed upon. Diaz said despite how things went with lawmakers on Thursday, he and others like him who are advocating for a clean Dream Act devoid of border wall construction as a caveat to a DACA deal are optimistic a plan will be achieved soon.